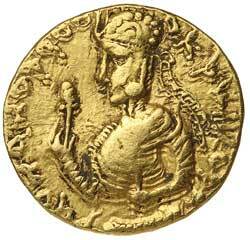 KUSHAN EMPIRE, Huvishka (155-190 A.D.), gold dinar, (7.84 g), obv. 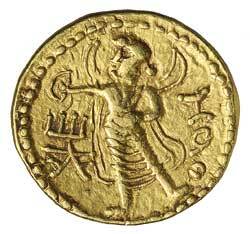 draped bust of the king to left, emerging from clouds, with flaming shoulders, wearing helmet and diadem, and holding sceptres in both hands, Bactrian legend ShAONANO ShAO OOEShki KOShANO around. rev: Moon god 'Mao' standing facing left, with crescent on shoulders, holding a standard in left hand and right hand on hip, Bactrian legend MAO in right field and Tamgha to left, (Gobl 296). Very fine/good very fine and very rare.